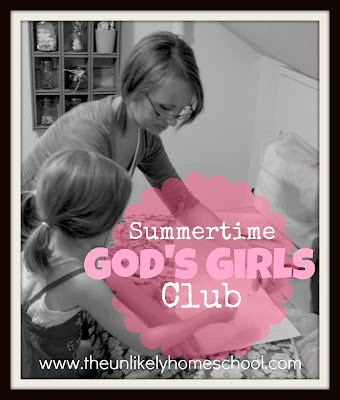 Glad you've joined us for another meeting of our Summertime God's Girls Club, a mother/daughter group that seeks to find joy in femininity and impart a love of homemaking to the next generation of Proverbs 31 girls. Throughout the summer, we have been working our way through Lady in Waiting for Little Girls: Strengthening the Heart of Your Princess by Jackie and Dede Kendall. This week's theme proved to be timely for all the ladies...both young and old...ahem...older. We started our discussion by learning that a God's Girl has FAITH...faith to believe His promises...faith to trust in His care...faith to rely on His protection. It was easy to see that the opposite of FAITH is FEAR. I reminded the girls of 2 Timothy 1:7 which declares that "God did not give us a spirit of fear, but of power, of love, and of self-discipline." If GOD did not give us fear, we can assume that it came from God's enemy, Satan. FAITH is from God; FEAR is from the devil. 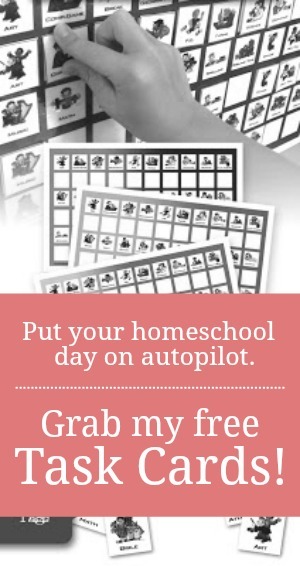 I passed around a bucket with slips of paper and pens and instructed everyone...moms included...to write one fear on a slip and return it to the bucket. As no names were included on the slips, I felt free to read the fears aloud. It was not surprising that many of the slips sounded the same and were filled with fears that OBVIOUSLY did not come from God. Before reading our Scripture story for the night, I read Proverbs 29:25 to each of the girls inserting her name and encouraging her to think of the fear she wrote down in replace of "people." "If you, [______________], are afraid of people, it will trap you. But if you trust in the Lord, he will keep you safe." Deborah's willingness to lead an army of untrained men into battle when Barak stood in fear showed her great faith in God's promise of victory. Because of her bold trust in God's protection, Sisera and his Canaanite army was handed over to a WOMAN..one of God's Girls. As a bowl/plate of food is passed, only take as much as you KNOW you are going to eat. You can always go back for seconds after everyone has been served. When using a spoon to eat "liquid" food items...soup, cereal, YOGURT, etc...push the spoon out and away from you as you scoop to prevent spilling food in your lap. Table conversation should include everyone at the table. We practiced choosing table topics by asking simple questions of one another. Table conversation should only be heard by those at your table and should NOT include "potty talk", gossip, or one's distaste for a food item being served. This particular craft will be a three-part project to be continued at our next meeting and completed at our final night. Although a couple of the girls had some previous sewing experience, I wanted a project that would focus on basic sewing skills and techniques. Although our bags will be functional, they will not be too ostentatious. The point of this entire undertaking is to focus on the PROCESS not the PRODUCT. Obviously, a bag made of simple rectangular shapes does not REQUIRE a pattern; a rotary cutter and quilter's rule would have been a much simpler method. But, I wanted to give the girls some practice at working with a pattern. Using large sheets of newsprint (You could use butcher paper. ), I drew out a simple sewing blueprint. Rectangle "A" will become the bag portion and measures 17 1/2 x 14 inches on the paper. Rectangle "B" is the start of the strap and is 24 x 3 inches on the page. Unfold and "read" your pattern. Cut out the pattern using PAPER scissors. Fold the "main" fabric in half lining up the salvage (factory created) edges. Place the dotted line of pattern "A" onto the fold (parallel to the salvage edge) of the main fabric and pin in place. Cut around the pattern using FABRIC scissors. Place pattern "B" onto the coordinating fabric, pin, and cut. Repeat #7 to make two exact pieces. (Since pattern "B" was just a rectangle, we cheated and folded the coordinating fabric in half lengthwise (perpendicular to the salvage edge), pinned the pattern in the middle of the fabric (NOT on the fold), and cut creating 2 identical pieces at the same time. We kept all of our pattern pieces pinned to the fabric for safe keeping until our next meeting when we will begin sewing them together. Do you have a picture of the finished bag? We haven't completed them yet, Holly. I make bags often and rarely use a pattern. I just made this one up, so we will see. It will be a simple rectangular shape with one long strap for crossing over your torso...or just hanging loose at your side.